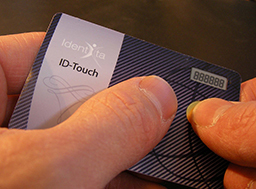 Identita's display cards use time-based state-of-the-art dynamic one-time pass (OTP) technology. Each time a user presses the card button, this powered smart card displays a unique OTP sequence to enable authentication with any computing device or through a telephone. 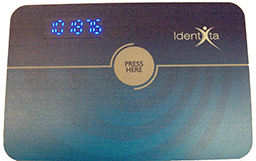 Display cards are extensible to three-factor authentication with the addition of built-in biometric sensors. 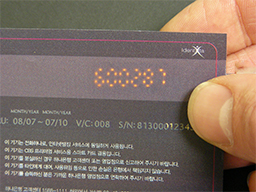 When a user presses the button on their display card, the card displays a dynamic OTP signature which is translated into six,eight or twelve digits and then displayed on the card. Depending on the application, either the client application or the authentication server captures a binary representation of the OTP and relays it with the user's pin/passphrase to the authentication server. Once the OTP and password are verified by the authentication server, access to the application or resource is granted. Most companies still do not have some manner of two-factor authentication, even for remote users. This reflects the high capital costs associated with purchasing, installing and maintaining the average security key fob or smart card infrastructure. Identita's EchoSystem authentication device breaks this barrier, adapting to any environment without requiring a specific reader. EchoSystem's solutions are not only secure, they are also the most cost-effective identity authentication systems available. These solutions can be deployed rapidly across current infrastructure and integrated seamlessly with existing security frameworks and protocols.